"In this world, there are things you can only do alone, and things you can only do with somebody else. It’s important to combine the two in just the right amount." All of your characters, both in this book and in previous novels, display a really interesting appreciation for jazz, classical, and rock music. 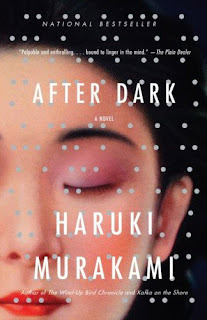 What musical pieces would you include on a Murakami playlist of sorts that would represent the range of music in your books? Music is an indispensable part of my life. Whenever I write a novel, music just sort of naturally slips in (much like cats do, I suppose.) When I was writing my newest novel, After Dark, the melody of Curtis Fuller's "Five Spot After Dark" kept running through my head. Music always stimulates my imagination. When I'm writing I usually have some Baroque music on low in the background chamber music by Bach, Telemann, and the like.